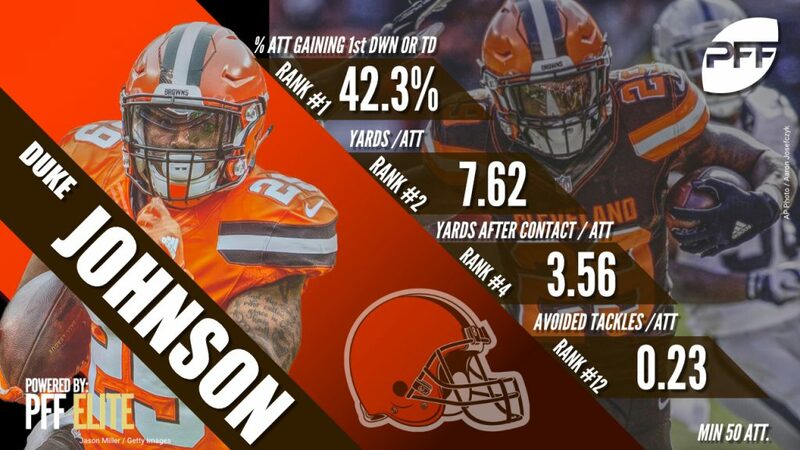 Under the helm of Hue Jackson and Todd Haley in Weeks 1-8, fourth-year running back Duke Johnson Jr. was an afterthought in a Cleveland Browns offense that was desperate for playmakers. He averaged just 5.25 touches per game through the first eight weeks of the season, ranking outside the top-60 NFL running backs. New leadership, however, took a different approach to Johnson’s involvement in the game plan in Week 9, leading to season-highs for the former Miami (Fla.) product across the board. Dissatisfied with his offensive-minded coaches, Jackson and Haley, Browns general manager John Dorsey fired the duo following the team’s blowout loss to the Pittsburgh Steelers in Week 8 and promoted running backs coach Freddie Kitchens to offensive coordinator. Kitchens moved quickly in getting Johnson the football in his first game pulling strings. After averaging 3.5 targets per game in Weeks 1-8, Johnson caught all nine of his targets – a week-high among running backs – for 78 yards, four first downs and two touchdowns. Two of his receptions went for 15-plus yards, and he totaled 33 of his 78 receiving yards (42.3%) after contact. He also forced two missed tackles and picked up 14 yards after contact on his lone rushing attempt on the day. Johnson’s two-touchdown, 86-yard performance was in a losing effort against the Kansas City Chiefs, but it’s a sign of brighter things to come for him and the Browns’ offense. With his efficient outing in Week 9, Johnson now ranks first among all NFL running backs with 50-plus touches in percentage of touches resulting in a first down or touchdown (42.3%) and second in yards per touch (7.62). In terms of creating yards on his own, he ranks fourth among the same group of backs in yards after contact per touch (3.56) and T-12th in forced missed tackles per touch (0.23) – two impressive figures for a 5-foot-9, 210-pound back with limited touches. Johnson’s 2018 campaign isn’t an outlier, either. Among backs with 300-plus touches since the start of the 2015 season, Johnson ranks tied for first in forced missed tackles per touch (0.24), fourth in yards per touch (6.45) and third in percentage of touches resulting in a first down or touchdown (32.7%). Additionally, Johnson leads all backs in total receptions of 15-plus yards with 48 dating back to his rookie season (2015), nine more than any other running back in that span. He also ranks second in yards per route run (1.75) among the 33 running backs with 600-plus receiving snaps from 2015-18, another testament to his receiving ability. Dorsey signed Johnson to a three-year contract extension prior to the season because he understood his value. Jackson and Haley obviously didn’t; Kitchen seemingly does. With strong early returns from Johnson in Week 9, expect Cleveland to turn a one-week anomaly into a week-to-week norm in regards to his usage moving forward.